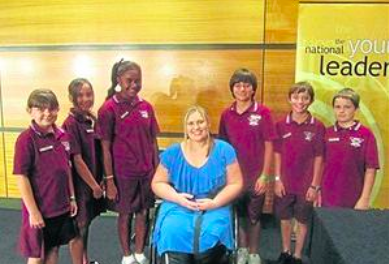 Over 3000 primary school students from around Queensland were inspired by Marayke’s presentation at the National Young Leaders Day event in Brisbane. Marayke joined fellow speakers Graham Quirk, Lord Mayor of Brisbane, Beau Robinson from the QLD Reds and Tiger trainer Giles Clark from Australia Zoo. After the event finished, Marayke enjoyed chatting to some of the students as the lined up for autographs. To be recognised and considered for the Sporting Dreams Grant, having already received an introductory grant in 2012, and now a Developmental Athletes Grant in 2014 is an honour and a privilege. I am thankful for organisations such as the Sporting Dreams. lf it was not for such associations that exist and care for disabled athletes they would never achieve their goals and dreams. There are many disabled athletes just as deserving as me and I thank you kindly especially Marayake Jonkers, you will always be an inspiration and a legend in my eyes. Sporting Dreams helps inspire athletes by supporting and acknowledging disabled athletes aspirations. Attending the Ceremony showed me how many marvelous people there are striving to achieve their own personal goal. Sporting Dreams is important because it encourages you and helps you to chase your dream. I have competed in the State and National RDA (Riding for the Disabled ) championships this year. My Sporting Dreams grant enabled me to pay the entry fees for my horse riding competitions. Sporting dreams is important because it encourages you and helps you to chase your dream. Sporting Dreams helps inspire athletes by supporting and acknowledging disabled athletes aspirations.